It was all about the financials again this week. Citigroup reported over $8 billion in losses for the most recent quarter and announced it was splitting up into two entities: one to concentrate on core investment and banking activities, credit cards and high net worth individuals and another to hold all "non-core" businesses like real estate lending, private branded credit cards, various kinds of consumer lending (CitiFinancial, Primerica, student loan and auto lending) and most of the toxic waste currently dragging down the balance sheet. In addition, Citi did a deal to sell majority interest in its brokerage unit Smith Barney to Morgan Stanley. There was a whiff of desperation there as Smith Barney was actually one of Citi's profitable businesses. As if that wasn't exciting enough, we had Bank of America receiving another 11th hour bailout from the Treasury. BofA claimed that without it they wouldn't be able to complete the acquisition of Merrill Lynch. BofA then announced a $1.79 billion 4th quarter loss and that didn't even include an approximately $15 billion loss at Merrill. Looks like buying both Countrywide Financial and Merrill Lynch might not have been such great ideas after all. Before we leave the financials, which as a group fell 16% this week, we should note that JP Morgan-Chase announced disappointing earnings and downbeat guidance. This, from the strongest player in the financial sector. There were a few other things going on this week. Intel reported a 90% drop in earnings including a huge writedown on their Clearwire investment. Management indicated that there was no visibility for near-term revenue but that eventually things would improve. That slight wisp of hopefulness was enough to give the shares a boost. With respect to the economic reports for the week, December retail sales were about twice as bad as expected. Initial jobless claims jumped again this week. Our trade deficit narrowed, revealing an $8.7 billion drop in exports - no wonder our manufacturing reports have been so awful lately. In any case, stocks fell several percent this week and our TradeRadar indicators, for the most part, reflect this current fragility in the market. Each week our Alert HQ process scans over 7400 stocks and ETFs and records their technical characteristics. Primarily we look for BUY and SELL signals for our free stock alerts; however, we also summarize the data in order to gain insights in the week's market action. The following charts are based on daily data and present the state of some of our technical indicators. This next chart is based on Aroon Analysis and compares our trending statistics to the performance of SPY. We use Aroon to measure whether stocks are in strong up-trends or down-trends. The number of stocks in down-trends is indicated by the red line and the number of stocks in up-trends is indicated by the yellow line. The next chart applies some standard technical indicators to the stocks in the S&P 500 and summarizes the result by sector. If you compare this chart to last week's chart, you will notice that pretty much all the indicators for all the sectors have receded in a big way. Though financials may have been the worst sector this week, the weakness was broad-based. Our last chart shows SPY with a couple of annotations. The blue trend line sloping upward from left to right shows a clear violation to the downside. The horizontal blue line shows support in the area around $82.50 and, happily, SPY seems to be bouncing upward from this range. So we've had another down week. 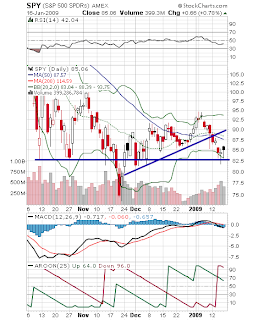 Technical analysts might point out that SPY, for example, is a bit oversold and appears to be bouncing up from its lower Bollinger Band and the support level described above. That is all well and good but stocks now seem to be reacting to the less than bright economic situation. It is unlikely that the economy will turn around on a dime but the government is doing what it can. The Wall Street Journal reported this weekend that the Obama team is crafting a plan to help banks by either guaranteeing or buying up their toxic assets. This will no doubt find a favorable reaction from investors when trading resumes. On the other hand, earnings season is picking up momentum. There will be plenty of financial and tech companies reporting and the numbers for most will no doubt be bad. Investors will be straining to hear an encouraging word during conference calls. Finally, there will be very little in the way of economic news being reported this week: building permits, housing starts, initial jobless claims and crude inventories. With the inauguration and the leaking news of a potential solution for the toxic waste clogging up the banking system, it's quite possible we will get an Obama bounce this week. The optimism may be short-lived, however, unless earnings season turns out to be better than expected.